These activities help students organize and analyze data. Consider using one of the winter-themed glyphs or adapt one of your own favorite winter craft projects to include this mathematical component. Students love to help develop the glyph legends as well. Check out the winter glyphs on the NEW Winter 2006 Math Activities page. See Winter 2005 Glyphs and how to use these resources to help students develop proficiency with data collection and analysis. NEW! See Elf Glyph: complete with legend and patterns for easy assembly by students. These investigations encourage students to apply mathematical analysis to real-life data and/or applications in order to investigate problems or issues. This new Mathwire.com webpage will continue to grow over the next few months as more investigations are added. See Data Analysis Investigations for links to these investigations. See Data Analysis 2 for more data collection activities. Give students practice in making and counting tallies with this simple game. Give each student a copy of the gameboard in a sheet protector. Each student rolls a die, then uses a dry erase marker to add that many tally marks to his/her game board. The first player to complete the tally chart of 30 tallies wins the game. Dotted lines remind students to "close the gate or door" to create a bundle of five tally marks. Four dots help students leave space between individual tally marks so that they can easily be counted. Download Tally Ho! gameboard and directions. 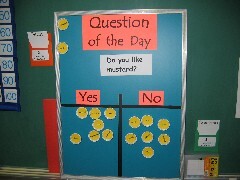 Glyphs are a fun way to add data collection activities to the math curriculum. 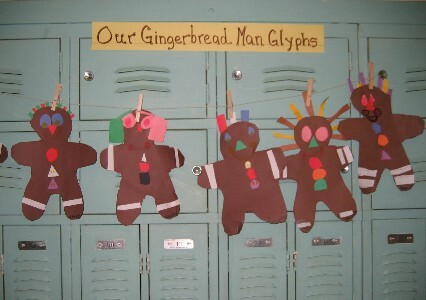 Creative teachers adapt seasonal and holiday craft projects to glyph activities. 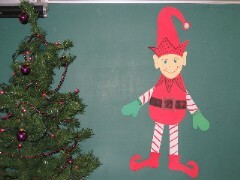 This elf glyph comes complete with legend and patterns for easy assembly by students. There are many elements of the design (belt, buckle, face) that were not included in the glyph legend. Please feel free to add these or to modify or omit any of the suggested glyph legend items to personalize the experience for your students. 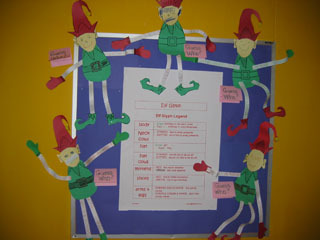 Although this activity was designed as a holiday glyph, the elf glyph could easily be modified for use with "The Elves and the Shoemaker" story as well simply by changing the colors and legend choices. Look for this version to follow shortly! Based on the Elf Glyph Legend, what do you know about the person who made this elf? 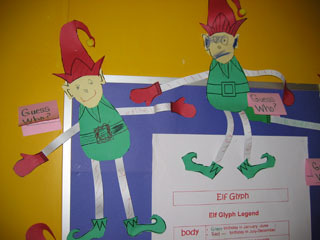 Mrs. Bestle's class at Port Monmouth Road School in Keansburg, NJ, made elf glyphs to display on the hall bulletin board. They challenged other students to guess who was who. NEW! See Winter 2006 for more winter math activities: Penguin Math, Snowflake Activities, Math-Literature Connections, Winter Problem Solving, and Winter Glyphs. These problems were designed to introduce kindergarten students to math word problems. As teachers read each sentence aloud, students should use simple drawings to help solve the problems.